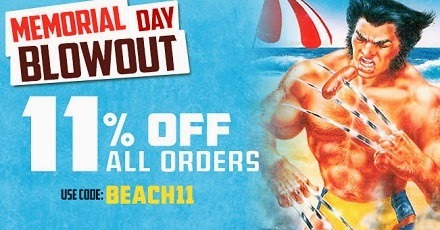 Memorial Day weekend is here, and as always, this unofficial beginning of summer is accompanied by a wave of sales. I'll be updating this list throughout the weekend, so be sure to check back later on today, 05.24.14, tomorrow, and Monday. Also remember to take a break at 3 p.m. (local time) Monday to remember those who made the ultimate sacrifice fighting for the United States Armed Forces. 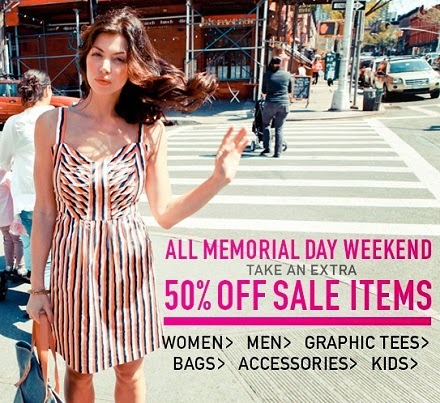 Brooklyn Industries - Extra 50% off all sale items. Discount will apply automatically in cart. The Chive - 15% off select items. Prices as marked. Creep Street - $20 Murder We Wrote II‬ tees and free goodies on all orders over $100! No code necessary. 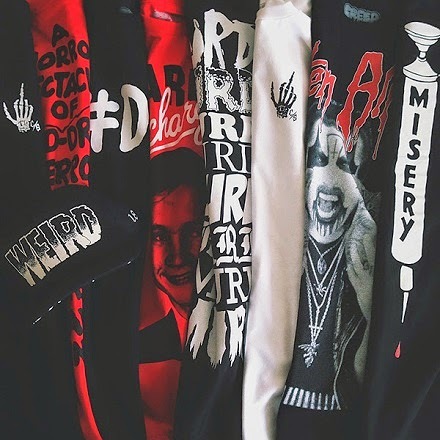 Use code NEVER4GET for free shipping on all orders. 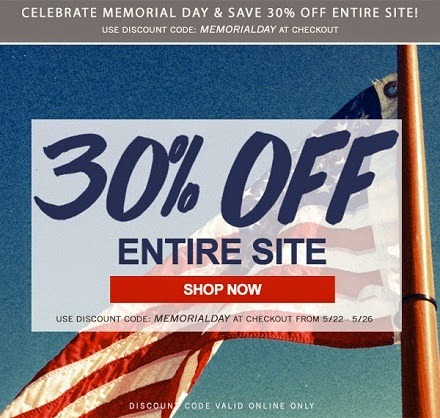 Design By Humans - 20% off sitewide with code DBHLIBERTY. 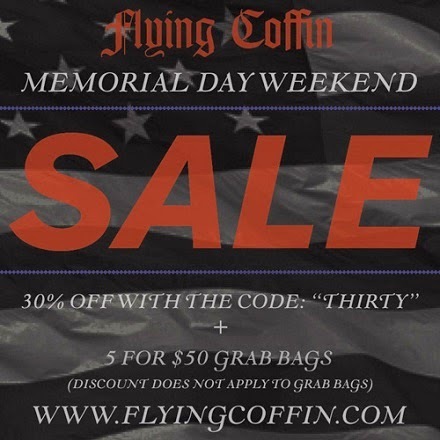 Flying Coffin - 30% off with code THIRTY plus 5 for $50 grab bags. 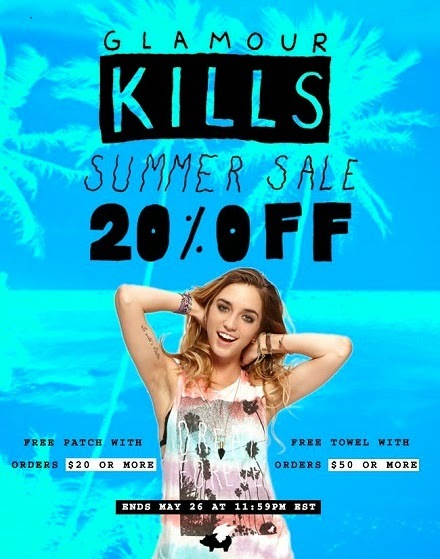 Glamour Kills - 20% off, prices as marked. Free patch with purchase; of $20 or more, free towel with $50 or more. 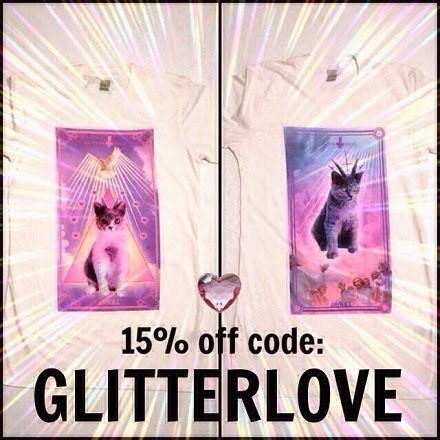 Glitterhell - Not a Memorial Day sale, but you can still get 15% off until the end of the month with code GLITTERLOVE. 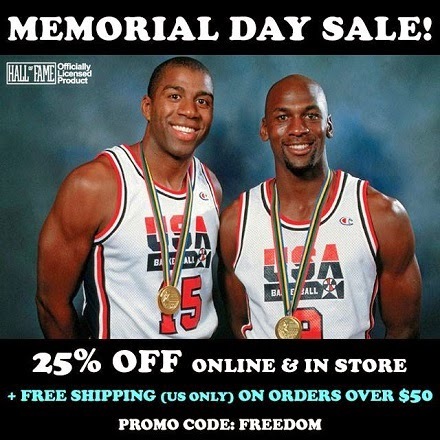 Hall of Fame - 25% off plus free shipping on U.S. orders over $50 with code FREEDOM. 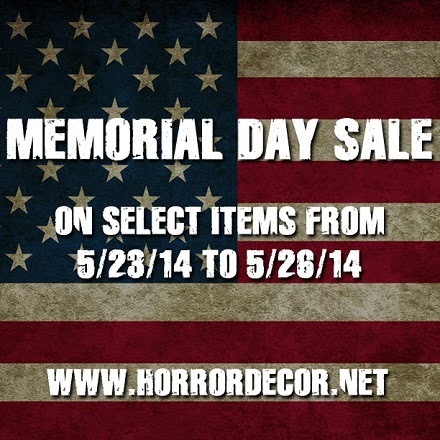 Horror Decor - Select items on sale, no code necessary. The House - Save up to 50% off select summer gear. 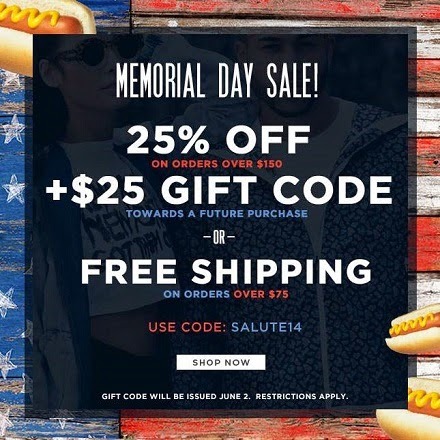 Karmaloop - Code SALUTE14 will reward you 25% off orders over $150 + a $25 gift code for your next purchase or free shipping on orders over $75. 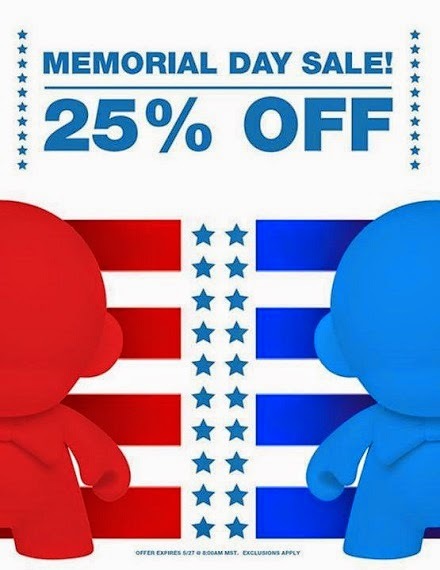 Kidrobot - 25% off entire store, but exclusions apply. No code needed. 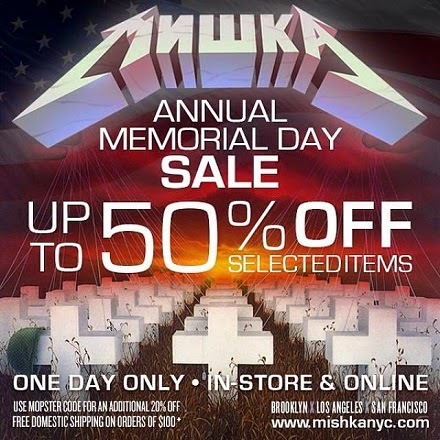 Mishka - 50% off selected items starting online 05.25.14, 11pm EST, into Memorial Day. 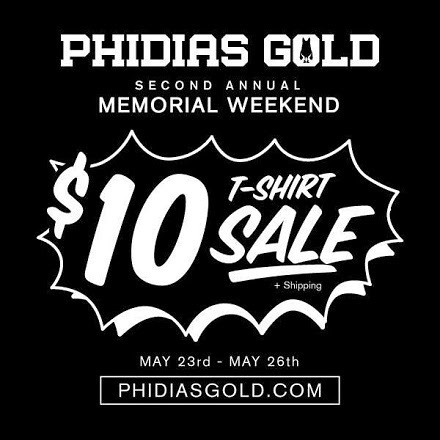 Phidias Gold - $10 shirts, no code necessary. 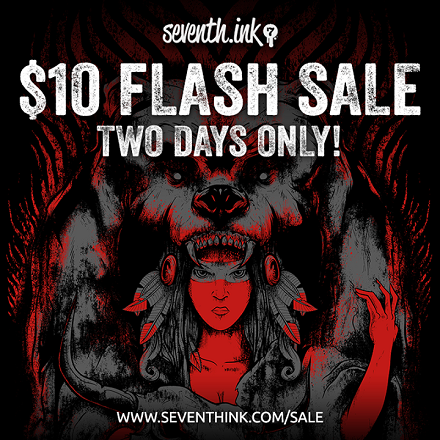 Seventh.Ink - Select items for only $10, no code needed. 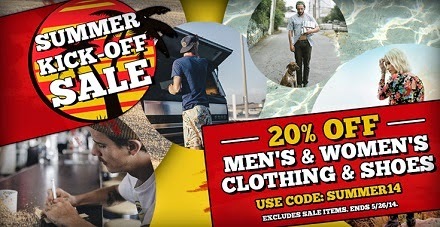 Tactics - Save 20% on men's & women's clothing & shoes! * Use code: SUMMER14. 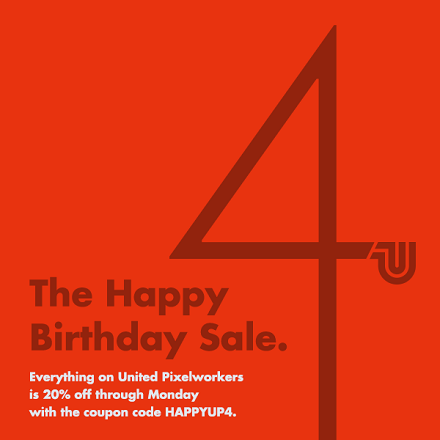 *Exclusions apply. 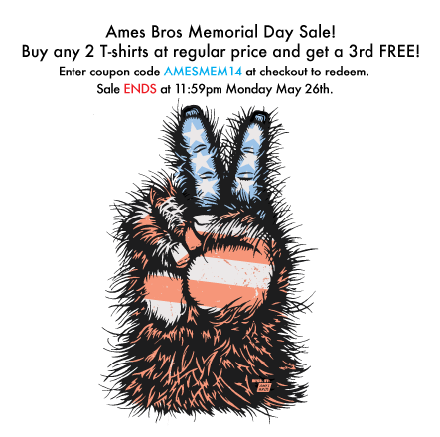 Ends 5/26/14. 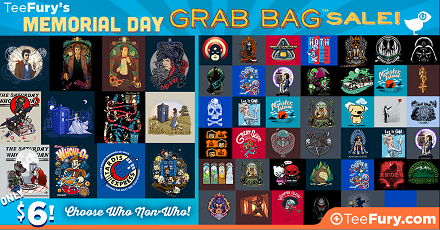 TeeFury - $6 Grab Bag Sale on Memorial Day only. 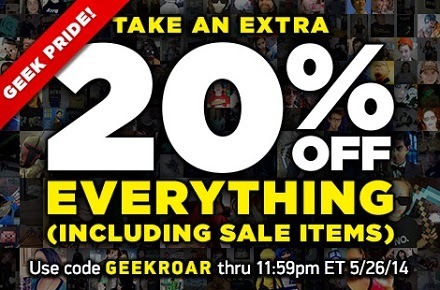 ThinkGeek - For Geek Pride Day, take 20% all items including those on sale with code GEEKROAR. Threadless - 30% to 89% off sitewide, no code needed. 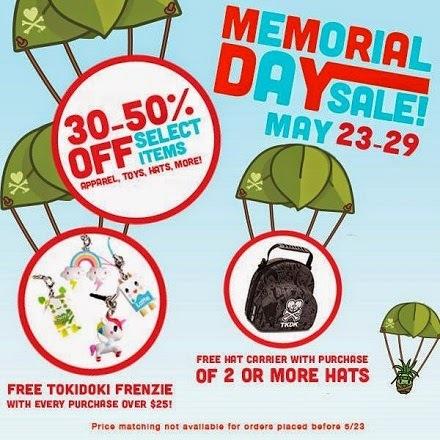 Tokidoki - 30% - 50% off select items. Free hat carrier with the purchase of two or more hats, and free "Frenzie" with every purchase over $25. Prices as marked. 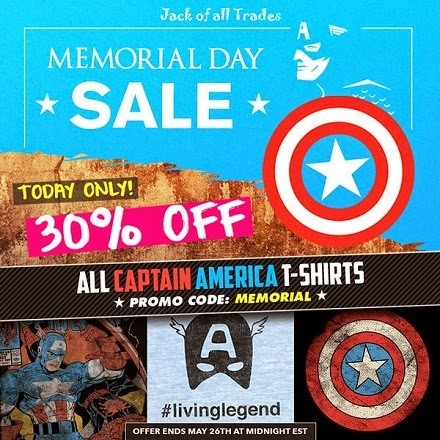 WeLoveFine - Not a Memorial Day sale, but a Geek Pride Day sale. 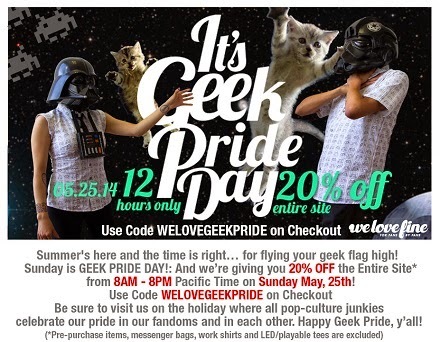 WELOVEGEEKPRIDE will get you 20% off for 12 hours only on Sunday, 05.25.14.